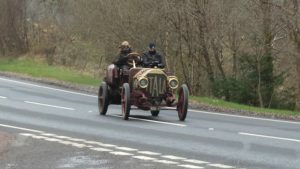 Last Sunday, 7th April, gave us the rare opportunity of seeing over 80 classic cars pass through our region whilst competing in the 2019 Flying Scotsman 2019 Endurance Rally. The Rally had started on Friday 5th April in the Lake District before winding it’s way north for the last leg on Sunday which started at Turnberry and wound it’s way through central Scotland to finish at the Gleneagles Hotel near Auchterarder. 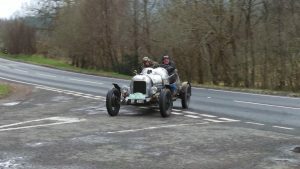 The cars had stopped in Callander for a lunch break before travelling to Lochearnhead where they turned onto the South Loch Road and drove along the southern side of Loch Earn before heading off towards Gleneagles. There were 86 cars still running on the Sunday morning with the youngest cars being made in 1948 and the oldest model being a 1907 Italia 40. The eventual winner of the event this year was car number 12, a 1928 Ford Model A Special. Full details of the entrants and finishing positions can be found on the Endurance Rally Association website at http://www.endurancerally.co.uk/pages/flying-scotsman-rally-2019.